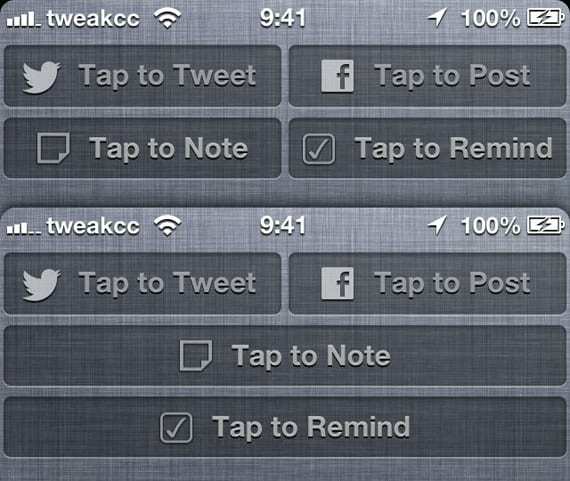 To Note and Tap Tap To Remind are two simple tweaks that will add a widget to your each notification center. As their names indicate Tap Note To allow us to add a note with one touch on the screen and tap to Remind do the same with the reminders. The best thing is how they are integrated in the system, when clicked will open a pop-up on the Notifications Center itself, fully integrated, much like those that appear to share something on twitter or Facebook from the Notifications Center. Moreover, as seen in the image, you can configure them to take the full width of the screen or only half, unifying these amendments in a single line Notifications Center. The only bad thing is you can not buy them together, you'll pay for each. You can download every tweak in Cydia for $ 0.99, that is, $ 1.98 both modifications, you will find them in the BigBoss repo. You need to have done the jailbreak on your device. Article and Tap Tap To Note To Remind: Notes and Reminders from the Notification Center (Cydia) was originally published in News iPhone .